It was a much-improved display from the Holywood man as he posted a final score of five under (283) to make inroads on the leaderboard. Starting off the 10th tied, he recorded his third eagle of the week - this time at the par-five 13th, despite clipping the trees on the left with his drive - and birdies at 15, one, two and eight. A bogey free round was on the cards for the first time at this year’s event, with 14 under his belt going into Sunday’s play. 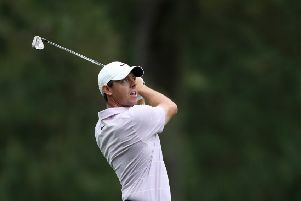 Yet two came in quick succession - at the fourth and sixth holes - much to the annoyance of the 29-year-old, whose wait to complete golf’s grand slam carries over for another year. Nevertheless, the four-time Major winner will be pleased with his final-round efforts, which began earlier than expected at 7.52am local time in the company of Gary Woodland (three under) and Keegan Bradley (one under) because of the possibility over severe weather later in the day. The aim going into his final round was to finish on a high. There’s no doubt that objective was achieved. But the recently-crowned Players’ Championship winner will be disappointed that attention lay elsewhere today - particularly the battle between Francesco Molinari and Tiger Woods at the top of the leaderboard - and that another chance at the grand slam had passed him by.